Mass Notifications is a communications technique for combining digital equipment with digital services so they work together to notify a large population of an emergency, event, outage, weather alert, etc. quickly and efficiently– all with the push of a button. By incorporating existing digital equipment and utilizing voice, text, video, data, IP and analog systems and services, messages are sent efficiently and in real time to multiple subsystems such as digital signage, loudspeakers, two-way radios, and more. students instantaneously if there is an emergency? 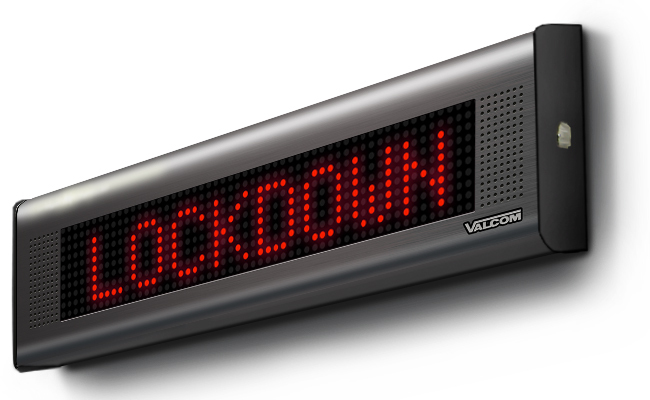 The answer is ACC’s eLaunch Mass Emergency Notification System by Valcom. With over 800 delivery methods/actions, notifications are sent via smart design, so you are only notifying the right people, at the right location, and on the right device. Send live or pre-recorded messages with voice-to-text capabilities. browser interface with the ability to create scenario-based notifications to reduce confusion during an emergency. A single click automatically launches a series of notifications to specific people, rooms, floors, buildings, campus-wide, or entire districts. can form a complete and comprehensive unified mass notifications system for a fraction of the cost! 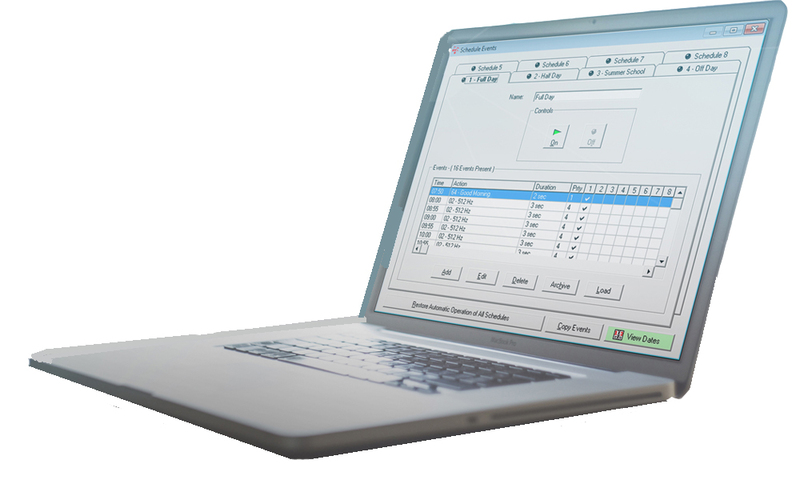 This allows an operator to launch messages to all or some of the subsystems within seconds– without having to deal individually with each subsystem. Use your existing intercom assets or contact ACC Telecom to install a new talkback intercom, overhead paging, and Call Buttons. are always synchronized to the exact time. Use our School Automation software to link live or pre-recorded announcements to your schedules such as the Pledge of Allegiance, parent pick-up notifications and bus loading/unloading safety reminders. With our Daily Communications feature, you can easily reach a single room, building, or entire campus with live or pre-recorded voice announcements using options such as text-to-speech or Wav files uploads. Create & Automate Bell Schedules, Announcements, Daily Communications, and Mass Notifications. I already have a text & calling system for Mass Alerts. Why should I care about your system? Sending text messages and outbound call dialers are considered secondary forms of mass communications because people may not answer the phone and texts are carrier-dependant for delivery. ACC's mass notifications system can incorporate text, calls, and e-mails, but it focuses on primary forms of mass notifications and allows you to fill in the gaps of what you’re missing-- providing an all-around unified solution to notify internal and external individuals of events, emergencies, and alerts in real-time. There are so many things that our Mass Notifications System (MNS) can do that we constantly hear, "you can do that!?" Our MNS is more than a Mass Alert System-- it can activate your security cameras, lock the doors, dim the lights, monitor appliances, and more. It also provides extremely beneficial day-to-day operations such as creating and automating bell schedules, announcements, and daily communications. Your customized Mass Notifications System portal will provide a floorplan of your campus, allowing you to drag and drop notifications to certain areas of the campus while utilizing text-to-speech capabilities and pre-setting notifications for any type of situation. How does your system differ from the competition? Our system offers the highest quality and reliability on the market today, but for a fraction of the cost. We do not charge annual subscription or recurring licensing fees-- saving your school thousands of dollars each year. 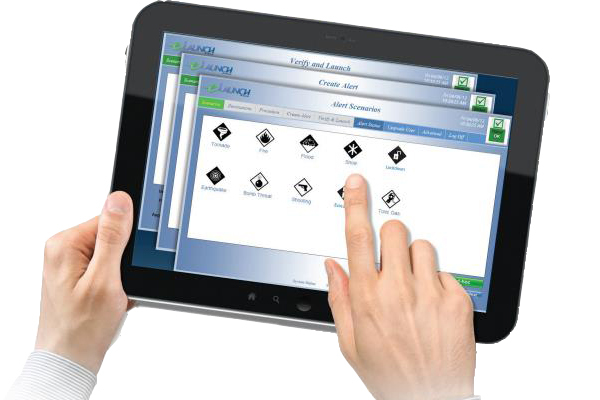 Our Mass Notifications System (MNS) also includes a mobile app, user portal, and free software updates. Furthermore, ACC's MNS system utilizes your existing subsystems and technologies-- so there is no need to overhaul your entire communications platform. Plus, our solution is fully customizable so you're only paying for features that you need. ACC Telecom's Mass Notifications System offers additional functionality for everyday use such as automating bell schedules & announcements, monitoring and controlling electrical systems, activating security cameras, monitoring appliances, creating a local or district-wide geo-fence, and controlling access control systems. Can your system be used for other industries? Yes! 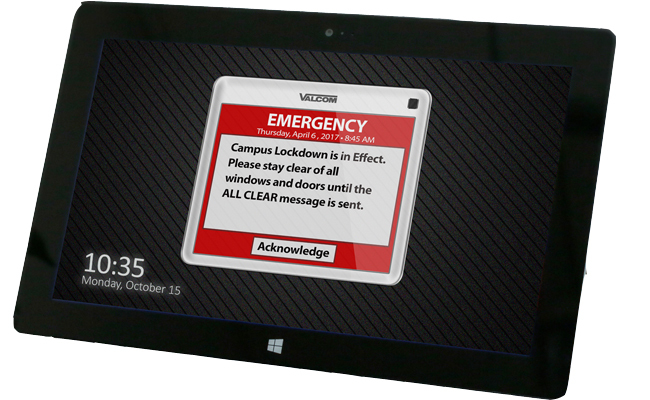 Our Mass Notifications System is perfect for higher education, healthcare/hospitals, manufacturing, or any large business or building that wants to provide both safety and real-time awareness in the event of an emergency. Can I use my existing equipment? Yes! There is no need to overhaul your entire communications system. By tying together your existing assets and service providers and letting us fill in the gaps, you can form a complete, comprehensive, and affordable Mass Notifications System. Is your system cloud-based or on-premise? Our Mass Notifications System is an on-premise solution using gateways and servers. We sell multiple Cloud-based products & services, but we DO NOT recommend placing a system of this importance in the Cloud because of bandwidth instability. What does your system cost? Since no two schools are the same, we recommend beginning with a site survey. This will allow us to see what's already in place so we can leverage your existing equipment and fill in the gaps of what's needed. Our Mass Notifications System is highly affordable. We do not charge annual subscription or licensing fees-- saving your school thousands of dollars each year. Our Mass Notifications System (MNS) also includes a free mobile app, user portal, free software updates, and is customized to fit your school's needs and budget. are customized to fit your budget and are available for any size or type of business. Contact ACC Telecom to learn more about Mass Communications Systems powered by Valcom’s eLaunch. We are located in Columbia, MD, and serve businesses throughout Maryland, Washington DC, and Virginia. I am very impressed with ACC Telecom. Between the sales and installation, everything went great and I will continue to highly recommend ACC." Let us help you build a future of communications for your business.